We arrived in the center of Slovakia today, in Banska Bistryca on the river Hron and at the feet of the low Tarta mountains, where we were welcomed by the regional governor, M. Lunter. He is leading a region of around 600.000 inhabitants. The governor fully supports civil society initiatives in the social field and in that spirit he welcomes our EMIN initiative. The former communist system, according to the governor, took away responsibilities from families and individuals, but the state left lots of gaps in the welfare system that no-one filled in. He sees it as his mission to work with civil society organisations to organise service provision for the citizens, especially in the field of fighting poverty an exclusion. De-institutionalisation of care is a big issue in the region, where care for people often is left to anonymous and poor quality state institutions. Finding good alternatives through cooperation with civil society organisations and with the help of EU regional funds, is one of the mayor challenges for the region. The regional policy focusses on labour market participation, especially for long term unemployed, but also on specific services for vulnerable people, such as a laundry place, or public refrigerators and food banks for people in need. Alignement with federal policies would be welcome, according to the governor, since one of the problems is that people lose some of the benefits they are entitled to when they re-enter the labour market. 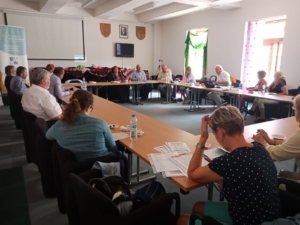 The region plans to invest much more in social economy initiatives and is very committed to work with organisations that engage with the Roma community which constitues a considerable minority in the region. The governor was very interested to learn about existing good practices accross Europe with regard to integration of Roma. Questionned about the appaling situation of the Roma community we visited in Romavska Sobota, he informed us about the initiatives the region takes to stimulate local authorities to take up responsibilities to ensure the rights of Roma people for example with regards to access to social housing The region also appeals to the federal government to assume their duties to meet expectations towards adequate income support. The morning session was concluded by a presentation of the ‘Hope for children’ initiative, a preschool programme that not only gives access to kindergarden for vulnerable kids from the Roma community, but also ensures that parents are fully involved, develop their own capablities to educate their children and give them perspective for a brighther future. The project already proved to be successful, since Roma children don’t end up in special schools. Instead they were invited to talk to members of parliament and give interviews at a radio station! 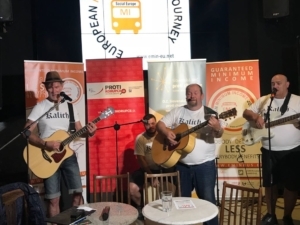 We crossed the High Tarta mountains to reach another destiny in our busy day: Zilina, a town in the North-West of Slovakia, where in the evening we had a discussion in bar Emotion. There we enjoyed the music of a band of engaged musicians who all had their personal stories with regard to poverty and exclusion. Father Gombita, the ambassador of the Slovak EMIN network, evangelical priest Marian Kanuch and the expert of the Slovak anti-poverty network, Martin Brnak, held a vivid discussion on causes of poverty, prejudices and discrimination, and possible solutions to end poverty. Given the history of the country, where solutions to problems where most often found in the state, but these solutions were hardly effective, the focus in the discussion was very much on the fact that the whole of society has to take responsibility to help the poor. The participants in the discussion insisted that humaniarian values oblige all people, rich or poor, powerful or not, to do what they can. For me, I felt releave at the end of the debate, to hear them say that in fact the rich and the powerful should assume more responsibilities. They expect brave political decisions to drastically increase the minimum income in Slovakia. Civil society organisations, faith-base communities and individuals can help to deliver more tailor-made solutions to empower people, but public authorities do have to assume their responsibilities to provide basic social security networks.